Through the years, I have posted several updates on the rare, but very treatable, Breast Implant Associated Anaplastic Large Cell Lymphoma (BIA-ALCL) on the San Francisco Plastic Surgery Blog. As of January 4, 2018, a pivotal new study was released in JAMA Oncology. An advanced case of BIA-ALCL. Arrows on this MRI point to white patches of increased fluid around the tumor cells. What Is The Risk of BIA-ALCL in Women With Breast Implants? To properly frame the answer obtained, it is important to note that BIA-ALCL is not breast cancer. However, the relative risk of BIA-ALCL compared to the risk of breast cancer is often used to give proper reference to how rare BIA-ALCL is. The study utilized the Netherlands’ Nationwide Network and Registry of Histo- and Cytopathology (PALGA). Over the 27 years, the study identified 32 patients with primary breast ALCL with a breast implants. Overall, 782 female patients were diagnosed with a non-Hodgkin lymphoma (NHL) of the breast in the Netherlands during 1990 to 2016. 43 primary breast-ALCL cases were confirmed. The median age of the 43 patients with breast-ALCL was 59 years. 32 of these patients had ipsilateral (same sided) breast implants, compared with 1 among 146 women with other primary breast lymphomas (OR, 421.8; 95% CI, 52.6-3385.2). BIA-ALCL seems to form on the surface of textured breast implants. The cells can also be found in the fluid that accumulates around the breast implant. The bacteria that form a biofilm around the textured implants have been associated with this tumor. BIA-ALCL is associated with textured breast implants. Out of 109,448 breast implants sold in the Netherlands, 49,109 were textured (P < 0.01). This means of the breast implants sold in the Netherlands, and presumably used, 45% are textured. In this study, however, 23 of 28 patients diagnosis with BIA-ALCL had textured breast implants at the time of their diagnosis or 82%. So the actual number of BIA-ALCL cases associated with textured implants was almost twice what would be expected if BIA-ALCL occurred at the same rate in textured and smooth breast implants. Even more importantly, in this study, it was unknown if the patients with smooth implants had previously had textured breast implants, but more on that below. The Plastic Surgery Foundation has the most complete and largest database of BIA-ALCL cases. As of December 1, 2017, of the 183 unique reported cases in the PROFILE database, every patient has had a textured breast implant prior to their diagnosis. Even women who had smooth breast implants at the time of their BIA-ALCL diagnosis, had previously had either a textured breast implant or a textured tissue expander prior to receiving their smooth breast implants. If you live to 80 years of age, your risk of developing breast cancer is 1:8. If you have breast implants, your risk of developing BIA-ALCL ranges from 1:1000 to 1:30,000 for women with textured breast implants, depending on which epidemiological study you read. In 2018, about 40,920 women in the U.S. are expected to die from breast cancer. World wide there have been 17 deaths from BIA-ALCL over the 56 years that breast implants have been available. Like breast cancer, early diagnosis is the key to a cure. Unlike breast cancer, BIA-ALCL is very treatable. 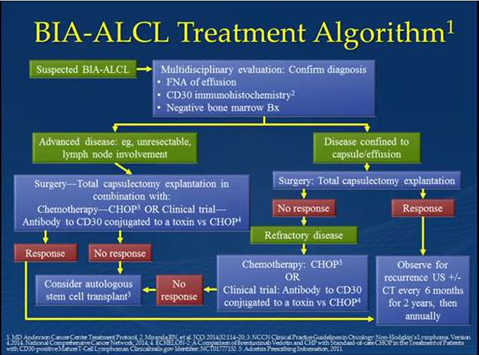 Current treatment of BIA-ALCL is usually curative, but depends on early diagnosis and appropriate treatment. Although it is unlikely that a woman with breast implants will ever have to deal with BIA-ALCL, it is important to know the symptoms and seek care if they develop. When BIA-ALCL is confined to the capsule, removing the breast implants and capsules has been curative for every patient to date. The majority of early stage patients require no additional treatment. Chemotherapy is required for unresectable disease to metastasis. Delaying or declining treatment is not advisable. Analysis of the known deaths from BIA-ALCL revealed that patients either received radiation (x-ray therapy) or chemotherapy alone, died of the treatment itself, had incomplete surgical resection or had distant metastasis. All cases of BIA-ALCL should be reported to the PROFILE registry. BIA-ALCL usually presents as unilateral (one-sided) swelling of the breasts, an average of 8-9 years after the insertion of textured breast implants (range 2-28 years reported). This can occur even if the breast implants have been replaced with smooth breast implants. Fluid around a textured breast implant is not usually due to BIA-ALCL, but it can be sent for analysis when the conditions are suspicious. BIA-ALCL can also present as a lump in the breast or in the armpit like breast cancer does. T – Textured Breast Implants – There have been no reported smooth-walled device cases at this time. I – Inflammation – Chronic inflammation has been implicated. Certain bacteria in the biofilm that forms around breast implants have been associated with an increased risk of BIA-ALCL. M – Mutations – There may be a link with genetic mutations in JAK1 and STAT3. Further research is necessary. D – Duration of Augmentation – Presentation is usually 8-9 years after textured breast implant insertion. Get checked out. See your primary medical doctor or your plastic surgeon. Get an updated medical history and physical examination. If enough fluid is present around the breast implant, a sample can be sent for analysis. 2-3 tablespoons are required for cytology and CD30 immunohistochemisty to rule out BIA-ALCL. Mammograms are not useful. PET/CT scans are used for staging.